Melt margarine and add syrup, cinnamon and lemon juice. 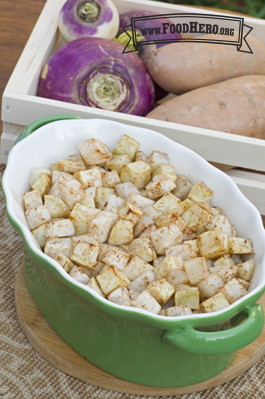 Mix turnips and sweet potatoes in a medium casserole dish. Add syrup mixture and stir to coat evenly. Cover and bake at 400 degrees F for 15 to 20 minutes. Uncover and bake until browned (20 to 30 minutes). Serve hot.